That sums up pretty much. What about the Mecklenburg medic bar in the bottom of the picture? could the 3rd and 4th ribbons be Verdienstkreuz of Hausorden der Wendischen Krone and Militär Verdienstkreuz? C. Zeige auctioned another group of ribbon bars lately, one of them seems to be a little odd that the 3rd Reich KVK is placed after the Hindy cross, and no long service medals, does it make any sense? Guys I really want to show you this Saxon-Weimar lifesaving medal, it's a real beauty. Thank you Andreas Hauptmann Leo von Gillhaußen was killed on the 6th of November 1918. Here I found a photo of the Gillhaußen brothers from gottmituns.net, Leo and his wife are on the left. Could this be Harry Gondi's ribbon bar? Found this photo showing Gondi wearing a long ribbon bar, also a TWM and a Silesian Eagle 1st class. Here is the scan from O‘Connor's book. Do you think it's the same person? He must be one of the 10 airmen who received the member cross of Hohenzollern house order with swords during WWI. Comparing the photo of Julius Tillmans in Neal O'Connor's aviation awards book vol.2, it seems to have some good match of facial character to our guy here. What do you think? It's possible but I doubt so. The reason is there isn't many award could be placed before his HoH3 on lifesaving ribbon according to war time rule, I can think of a EKII but nothing else really. He probably have another full decoration bar with all his awards including EKII, and Turkish gold and silver merit medals. His EK1 was awarded in 1915 for his participation in the Balkan wars. By the way he did receive the HOH3 on lifesaving ribbon in the middle of WW1. It was gazetted in the Prussian State Gazette (Deutscher Reichs- und Königlich Preußischer Staatsanzeiger). The HOH3 makes me believe this bar might be his interwar bar that intended to show his glorious lifesaving experience solely. And he probably started showing off his lifesaving award already in WWI. I was lucky enough seeing a photo album of officer corps of Ulanen Reg14. The album contains photo of several Ulanen 14 officers including Georg Veit and his son Otto Veit, I was curious to see both the father and son served in the same unit. 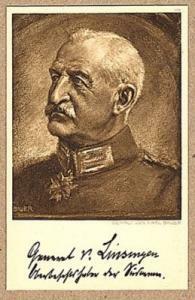 There are three photos of Georg Veit, one in civillian dress together with his son, and two photos with him in uniform and I could see he was wearing a light colour ribbon through button hole which might be for his Prussian lifesaving medal, his son Otto wears an EKII ribbon by the way. Father and son... From left, Lt. Veit, Oberst Veit (wear his lifesaving medal through button hole)... Veit (second from right) wear his lifesaving ribbon through button hole. His son Otto Veit... Another press photo showing him wearing his EKII ribbon and another black and white ribbon, could it be for his HOH3(on black and white ribbon)? Stafen thank you so much for sharing this important information! I have received another piece of information about our guy here. Thanks to Daniel ! This article describes for what he got the Red Eagle 3. Saving a Lady at the Bosporus - and got the Romanian Star Commander with swords for the Balkan wars and the Turkish Gold and Silver Medals.